Recent research has shown that a diet that is very low in carbs and high in good fats is effective for weight loss, can counteract many diseases and also help athletic performance and endurance. The drawback is that it is difficult to stick to - because most people love carbs. But, as The Hybrid Diet demonstrates, we don't need to choose. So many books have been written about the best diet. So many of them written by people who seem to have not the slightest idea about human physiology and biochemistry. Here, Patrick Holford and Jerome Burne have brought together the best, most up-to-date knowledge in the area. This book is detailed and thorough. If you follow the advice here, you will improve your health, lose weight, avoid diabetes and reduce your risk of cancer and Alzheimer's. What more could you ask? 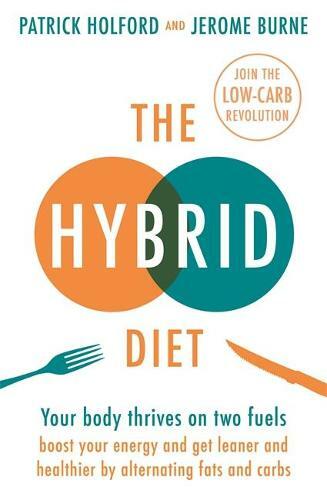 The Hybrid Diet is a very intriguing and interesting idea. Once we have cut out the table sugar and refined carbs, which create such metabolic havoc, we have a choice; to use fat or low GI 'slow' carbs for fuel. This enables individuals to experiment and create the best diet for their own good health. This is a book that is certainly original and very likely to be provocative. It's refreshing to explore what might work from more than one viewpoint. In a world where there seems to be no middle ground, this book dares to go there. Maybe we don't have to choose between fats or carbs. Maybe we can embrace real food in ways that accommodate both. Maybe the body works better when fuelling itself on either. Maybe there's something in the concept of a 'hybrid' diet. You probably won't agree with everything in it, but you won't know unless you read it! A thoughtful, intelligent, highly informative and practically useful contribution to the seemingly intractable debate on what constitutes a healthy diet. This book couldn't be more timely with the obesity and diabetes spiral at an all-time high. A versatile and accessible solution for anyone who's struggled with weight loss or low energy - essential reading. Patrick Holford and Jerome Burne are superb communicators and their writings are soundly based on the scientific and medical literature and very much at the forefront of nutritional medicine.